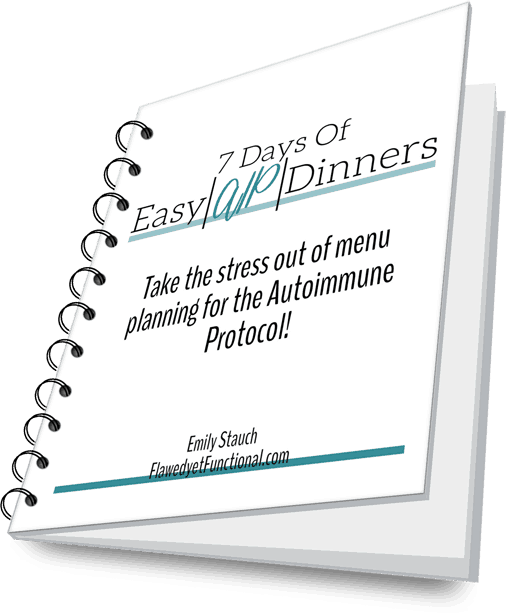 The biggest hurdle to get over when starting the Autoimmune Protocol diet is wrapping your mind around what to eat for breakfast. With all grains, eggs, nuts, and dairy off limits, panic might start to set in. What exactly can I eat for breakfast??? This is sort of a “well, duh!” statement, but it took me a while to come around to it: Breakfast is just another meal of the day. This means you can eat anything for breakfast that you would any other meal of the day! 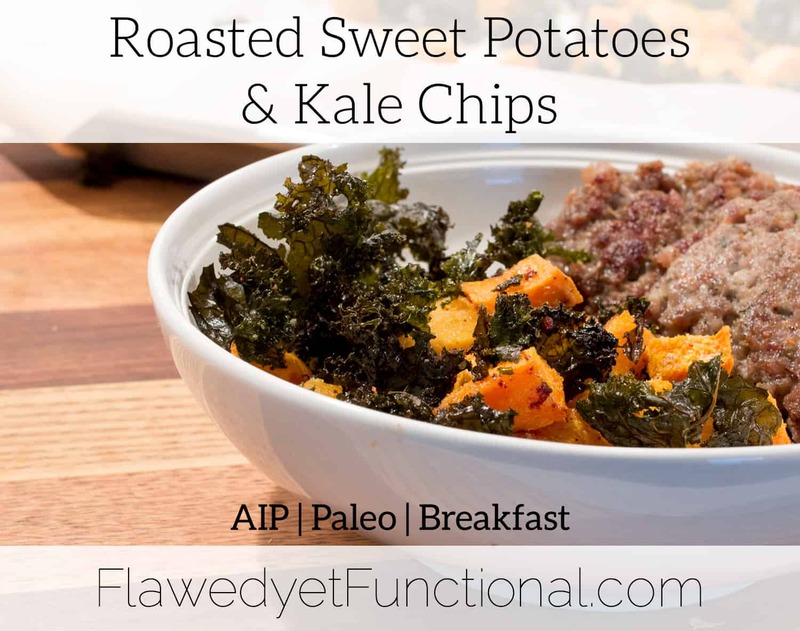 One of my favorite AIP compliant breakfast dishes is roasted sweet potatoes and kale chips. Are you ready for a breakfast dish full of complimenting opposites? Salty and sweet! Crunchy and soft! Hearty and light! 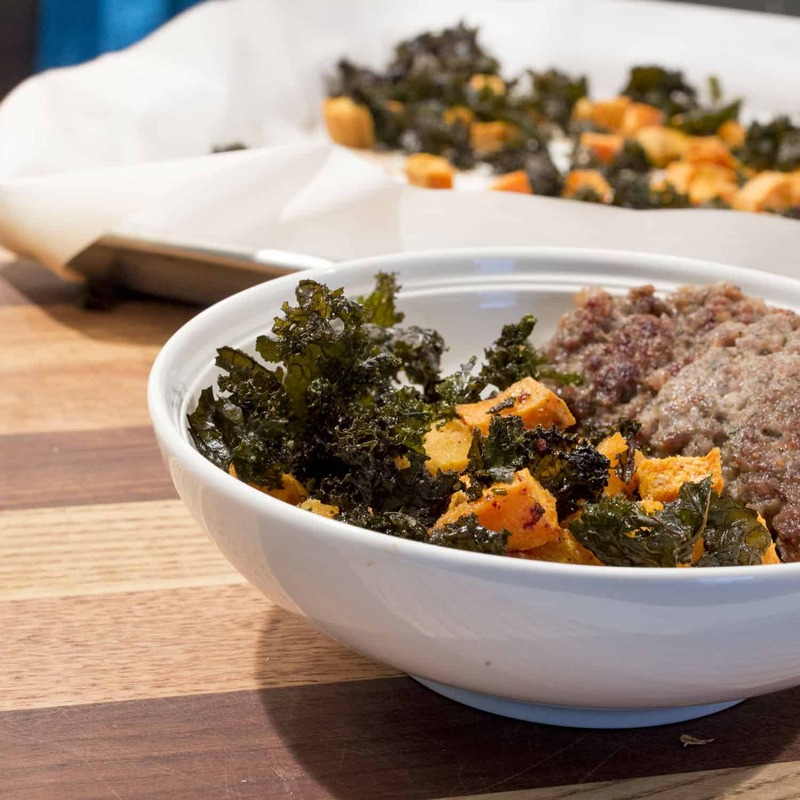 The sweet potatoes and kale are opposites in many ways, but roasting them together with a good amount of fat and seasoning turns these two into a delicious pair. My goal is for my family to eat a high -starch and low-starch vegetable at breakfast, but I don’t want to cook two separate vegetable dishes. That’s too much work so early in the morning! So one Sunday morning when I was running late, I threw some kale in with my sweet potatoes and it turned out delicious! Don’t you just love happy accidents? This recipe is now in my regular breakfast rotation. 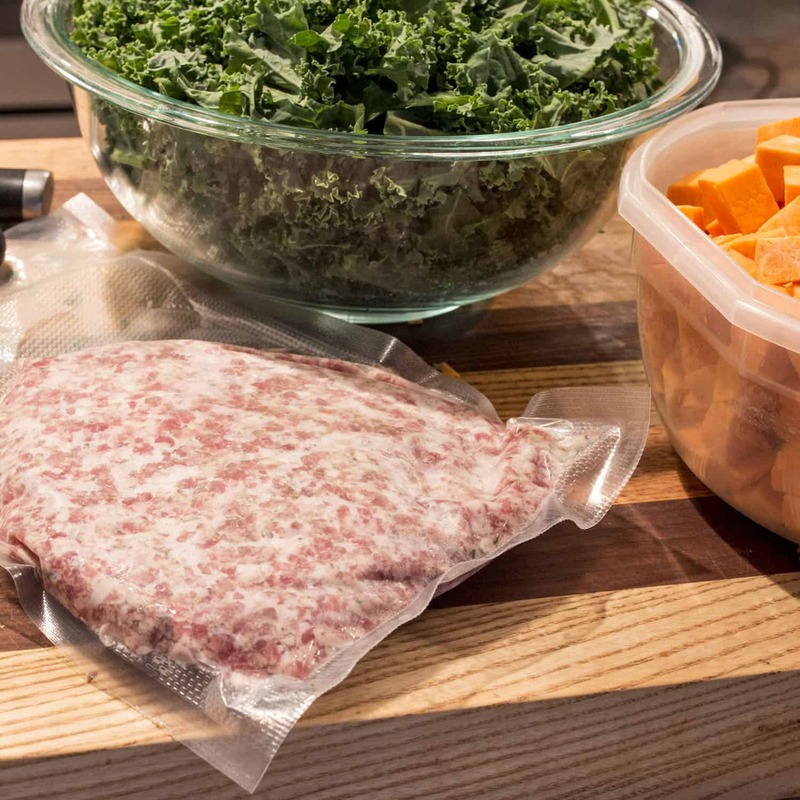 To save on prep time in the morning, chop the kale and sweet potatoes the night before. Place them in separate, air tight containers and store in the fridge. I take out the meat I plan to serve with the sweet potatoes and kale chips at this time too. Mise en place is done, and I’m ready to cook when I enter the kitchen in the morning! 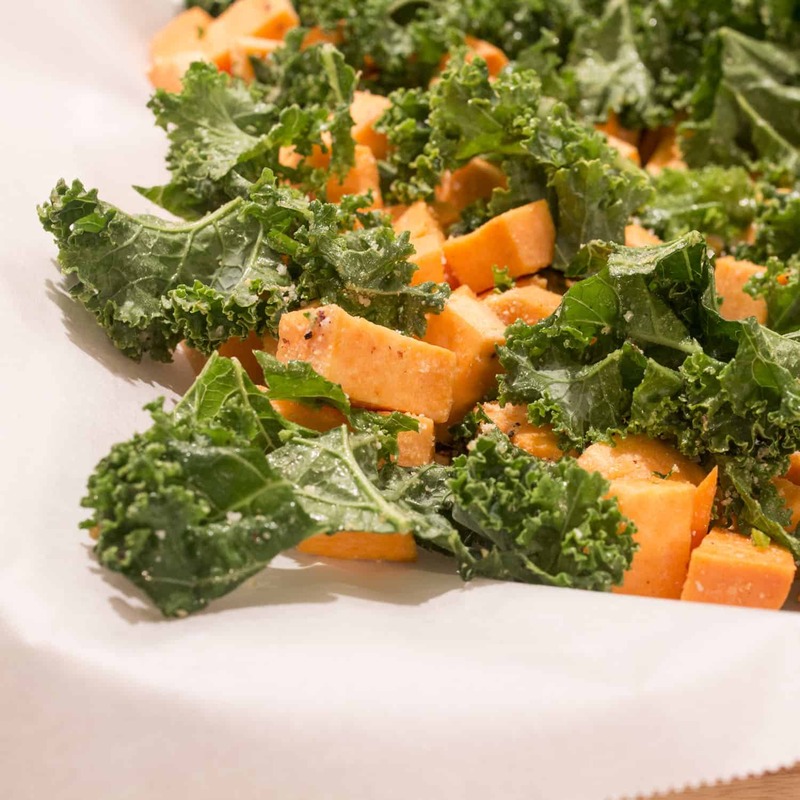 To fully cook the sweet potatoes without burning the kale, dice the sweet potatoes fairly small, less than 1/2″ dice. If we’re being precise, I’d say about a 3/8″ dice, 1/4″ is too small. Full disclosure: I had to look at a measuring tape to see how small I dice the potatoes. Eyeballing measurements is not my forte. Using bacon fat to coat the vegetables is the best fat to use, but if you don’t have any around, olive oil works just fine too. Any other oil/fat that is liquid or soft at room temperature will work. Coconut oil is not recommended as it will firm up quickly as it is mixed with the cold greens and sweet potatoes even when melted first. Once you have your fat of choice, make sure to use enough of it. The vegetables should glisten and the seasoning stick to all sides easily. However, don’t use so much fat that it pools in the bottom of the bowl. Just keep adding fat until it looks like below, add a small amount at a time to avoid overdoing it. I’m sure I’m not the only lazy cook/rule-breaker out there. You DO need to stir the vegetables halfway through the cook time. This will allow all the kale to dry out adequately and cook the sweet potatoes evenly. Don’t skip this step! 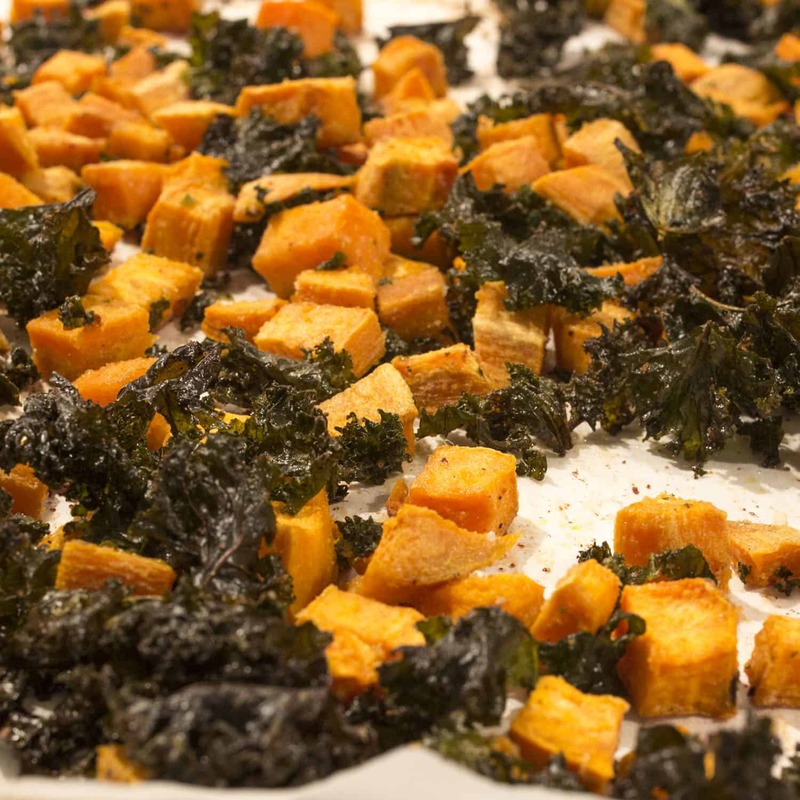 With those few tips, your sweet potatoes and kale chips should turn out fantastic! Serve this dish alongside your meat of choice, usually sausage patties or bacon for me, and enjoy this nutrient dense breakfast! Roasted sweet potato and kale chips, a part of this complete breakfast! AIP, Paleo breakfast dish that is egg-free, dairy-free, grain-free, hearty and satisfying! Serve with a side of your favorite breakfast meat for a complete breakfast. Preheat oven to 400° and line a rimmed baking sheet with parchment paper. In a large bowl, add all ingredients and stir to evenly coat. Add more bacon fat as necessary. Pour onto lined baking sheet. Spread so sweet potatoes are in single layer. Kale may rest on top of the sweet potatoes. If potatoes overlap, use two pans. Bake for 15 minutes. Remove from oven and stir. Bake for another 15 minutes. Remove from oven and stir again. If potatoes are not soft yet, continue baking for 5-10 more minutes until soft when poked with a fork. One serving has 34g of carbohydrates and 5g of fiber which results in a net carb count of 29g. What are your favorite hot breakfast dishes? Does anyone out there take the time for hot breakfast?